Makkar condemns Kuwait incident: SGPC chief Avtar Singh Makkar has condemned the alleged incident in which hair of a baptised Sikh youth were shorn off by jail officials in Kuwait. He said the incident had hurt the sentiments of Sikhs across the world. He urged the Kuwait Government to act tough on those who sheared Parminder Singh’s hair and ensure that such incidents did not recur in the future. 2nd counselling session from July 20: GNDU has announced to conduct second counselling session for admissions to BTech and BArch courses from July 20 to 25. The counselling would be held at Maharaja Ranjit Singh Bhawan, said Dr Hardeep Singh, counselling coordinator. He said candidates must see the university website for more details. DA for govt staff hiked: The Punjab Government has enhanced the dearness allowance payable to state government employees and pensioners, who are still getting unrevised scales, to 9.45 per cent. Finance Minister Parminder Singh Dhindsa said the hike would be applicable with effect from January 1, 2012. CM writes to PM on heritage buildings: Chief Minister Parkash Singh Badal has sought Prime Minister Dr Manmohan Singh's intervention for conserving the ancestral palace of Maharaja Ranjit Singh at Gujranwala and Maharaja Sher Singh's 'baradari' at Lahore, which were in a dilapidated condition. In a letter to the Prime Minister, Badal impressed upon the Prime Minister to take up the matter with the Pakistan Government. Sukhjeet Kaur sworn in as MLA: Punjab Vidhan Sabha Speaker Charanjit Singh Atwal on Tuesday administered the oath of office and secrecy to the newly elected BJP MLA from Dasuya constituency, Sukhjeet Kaur Sahi. Chief Minister Parkash Singh Badal was also present on the occasion. 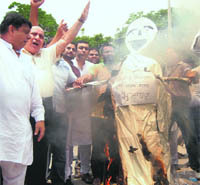 Congress protests power tariff hike: Congress activists on Tuesday burnt an effigy of the SAD-BJP government to protest the steep hike in power tariff. Led by PPCC secretary Virendra Sharma, the party workers gathered outside the District Administrative Complex and also raised slogans against the state government. Later, they submitted a memorandum demanding rollback of the hike to SDM Isha Kalia. Roko Cancer to hold mega camp: Roko Cancer, a London-based charitable trust, would be organising a mega cancer check-up camp at Sunam in Sangrur district on July 31 to pay tributes to martyr Udham Singh on his death anniversary. The camp would cater to 51 villages of the area. Trust’s global ambassador Kulwant Singh Dhaliwal said they would now onwards focus on detecting cancer at an early stage so that it could be treated. Professional commerce courses: Punjab Technical University (PTU) has granted affiliation to Ivanna Institute for BCom and MCom (professional) courses, to be run under the PTU DEP programme. These courses are designed for higher-level career placements. Khazan Singh is AICC co-ordinator: Haryana Congress spokesperson Khazan Singh has been appointed co-ordinator of the All-India Congress Committee (AICC) for Bihar with regard to Presidential election scheduled for July 19. A permanent invitee to the Congress Working Committee (CWC) and in charge of party’s affairs in Bihar, Punjab and Chandigarh, Gulchain Singh Charak, has made the appointment of Khazan Singh on behalf of the AICC. HAU college golden jubilee: The College of Agriculture, Haryana Agricultural University, celebrated its golden jubilee here on Tuesday. Vice-Chancellor Dr KS Khokhar said the college had played a big role in boosting agricultural production in the state. Lauding the role of scientists in increasing the agricultural output, Khokhar said the teachers and scientists of the college had set high standards for themselves. Two injured in road mishap:Two persons, including the driver of a truck, were seriously injured when a private truck rolled down the road near Andherani Nullah in the district last night, according to a report received here today. The report revealed that the injured had been identified as truck driver Ajay Kumar and another person Ravi Kumar who had been rushed to a hospital. The truck was loaded with cement, the report said, adding that the accident occurred due to the negligence of the driver. Left parties hold protest: CPI and CPM activists today held a protest in front of the Mandi Municipal Council office here and demanded a probe into the non-payment of an outstanding electricity bill amounting to Rs 8.46 crore.In a memorandum addressed to the Chief Minister, CPI town unit leader Samir Kashyap claimed that the silence of the government over the issue smacked of a scam. He said all previous office-bearers should be taken to task and the Chief Minister should order a probe to fix accountability. The Left parties warned that they would ask other social organisations to join the protest in front of the MC office until the power supply to the streetlights was restored. Resident Commissioner:PC Dhiman, Principal Secretary (Home), HP, has been appointed Resident Commissioner, Himachal Bhawan, in New Delhi. Dhiman will handle the position as an additional charge. He is also looking after the Information Technology and Vigilance departments of the HP Government. Former Resident Commissioner, Himachal Bhawan, PK Aggrawal, has joined as Joint Secretary in the Ministry of Housing and Urban Poverty Alleviation. Man crushed to death: A man was crushed to death by a tractor at Bus Stand, Katra, today. Reports said Mohan Lal (32) from Jaipur had come to pay obeisance at the Mata Vaishno Devi shrine along with his friends. The driver of the tractor has been arrested and the vehicle seized by the police.